The Case for Germany. The Winter Help Organization, by A. P. Laurie. Apart from the extreme poverty which seems to haunt our modern civilization especially in large cities, Germany has suffered terribly not only from the war but from the reparation payments; the occupation of the Ruhr which, under the incompetent socialist administration, brought about the flight from the mark ruining thousands of homes; and later on the appalling amount of unemployment. The National Socialist Party as soon as they came into power decided that the distress, especially in great cities, quite apart from Government relief and work for the unemployed, required the personal touch of a voluntary association and so with characteristic German thoroughness they proceeded to do it. In this as in all other matters where the volunteer worker is wanted, the Nazi organization covering the whole country is of course invaluable. The aim of the National Socialist Welfare Society is the relief of persons who are physically and mentally sound, but who, in consequence of adverse general conditions, have fallen into a state of distress which threatens the health and development of both themselves and their dependents. In accordance with this principle of preserving the healthy part of the German Nation, the National Socialist Welfare Society does not help those who are hereditarily diseased or suffering from incurable mental or physical diseases. These persons are cared for by the State. Any person in Germany may be given relief by the National Socialist Welfare Society, whether he is employed or not. Special attention is paid to persons who are employed but whose wages scarcely suffice to support their large families. Since the foundation of the Winter Help Scheme, the number of persons assisted has decreased steadily from 16,617,681 in 1933/34 to 13,866,571 in 1934/35 and 12,909,469 in 1935/36 and 10,711,526 in 1936/37, owing to the favourable development of employment and trade in Germany. It is to be noted that these figures include family members. The National Socialist Welfare Society never distributes money as relief. Relief always takes the form of goods. In this way any possibility of the relief being used for other purposes or unnecessary purchases is avoided. In order to increase the possibility of choice, increasing use has been made of vouchers for food, clothing, electricity, gas and other necessities. The Winter Help Scheme operates during the six months from October to March which experience has shown to be the most critical period of the year in regard to employment and sustenance. Many seasonal trades have to cease work during a great part of this period owing to inclement weather, and for the unemployed and those in receipt of small pensions the necessity of buying heating materials and winter clothing weighs heavily on a budget already burdened by the normal increase in price of many foodstuffs during winter time. The Winter Help Organization began in October 1933, with an initial contribution of 15,000,000 marks by the State. It collected not only contributions in kind, but also monetary contributions in many and varied appeals throughout the country, and used the funds collected for large scale buying of the necessities for daily life, thus making the money go considerably further than it would have gone had it been distributed as money. Apart from the initial gift mentioned, this organization receives no State assistance, and is supported entirely by individual people in Germany, through their contributions and sacrifices. It is a fundamental principle that the contributions must be absolutely voluntary. No one is in the slightest way forced to contribute. Contributions from individuals. These contributions may be divided into two kinds. First there are those from persons in receipt of wages, who may volunteer a monthly contribution of an amount equal to about 10 per cent of their monthly Wages Tax. This sum is collected by the firm, in so far as the employees have declared their consent. Secondly, those who are not employed, but who have a private income, volunteer contributions in the form of small deductions from their Postal or Bank accounts. Special advantages are gained through the free transport of coal for the Winter Help given by the German Railways. The transport costs must be paid, but are refunded later. Contributions by Germans living abroad, which are collected by the Foreign Department of the National Socialist Party. The proceeds from the "One Pot Meal". On the second Sunday in every month, a simple meal is prepared in all households. The money saved by giving up a more costly meal is forwarded to the Winter Help. 1. The National Socialist Welfare Society is organized with the object of helping so far as possible all those in need of relief. This is only possible through a considerable participation of the population in voluntary assistance work. The "helpers" are thus divided into two classes - those in receipt of salaries or remuneration, and honorary permanent and occasional helpers. The National Socialist organizations and unions are also called upon to help, as well as other societies dedicated to social work and whose membership is entirely voluntary. a) Block Leader. This leader is responsible for social supervision in a block which usually contains three or four tenements. He collects the regular contributions and his most important duty is to ascertain persons in need of assistance and to supervise their relief. This is a difficult and responsible position, as often - especially in the case of the most respectable people - those in distress are reluctant to acknowledge their condition. c) Local Group. The Local Group also receives all contributions in money and in kind from the cell leader. The Local Group, after consulting the Block and Cell Leaders, decides the relief which must be administered. d) The District Group, the Regional Group and the Reich administration are competent to administrate the organization of the National Socialist Welfare Society, and to administrate the monetary proceeds. The District and Regional Groups receive mostly goods presented by business concerns. The District Groups have often stocks of clothing, etc., and the Regional Groups always have supplies. Apart from the smaller relief, such as potatoes, coal and food, given regularly by the Local Group, the Regional Group provides more relief in the form of clothing, shoes, domestic utensils, furniture, and sends people to the country to recover their health. The person in need of relief is provided with the necessities on production of a certificate from his Local Group. All the money contributed is administered by the Regional and Reich administration. As mentioned above, no relief is given in the form of money, so these contributions are used to buy large quantities of goods, which makes it possible to obtain considerably lower prices. The difference of these wholesale prices and the retail values of the goods distributed appears as "added value" in the accounts of the Society. The costs of administration, of wages and compensation for the helpers are extremely small. During the Winter 1936/37 the total costs for salaries, wages, compensation, office work, printing, rent, light, heating etc. came to 1.84 per cent of the total proceeds. The total income for 1936/37 amounted to 387,088,000 marks without the "added value". This scheme has several good points worthy of our consideration. In the first place the whole ground of charitable relief is covered by one Society. There is no overlapping. In the second place the whole of a city is divided into small circles of three or four tenements in charge of the Block Leader, thus enabling the close personal supervision which alleviating real distress requires to prevent fraud. In the third place the payment is in kind. This does not of course eliminate the sale of food tickets for drink and similar abuses, but it is the best that can be done, and the Block Leader will soon discover such cases of fraud. The remarkably low administrative expense. The Society has 1,349,008 helpers of whom only 8,652 are paid. The "One Pot Meal" is an excellent idea and has become universal in Germany. It is a definite reminder of the needs of our poorer brethren and a simple sacrifice in which all participate. It is not only a source or income but has a symbolical meaning and an ethical value. 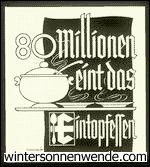 It is the boast of the Society that in Berlin last Winter not one person was inadequately fed or clothed or without a fire all the winter in one room. One of the interesting features of National Socialism is that it is developing its own symbolism. The march of the burnished spades, the slowly moving river of the blood red flags in the Stadium in the temple of light, the one pot meal, which will become a social sacrament, are all examples of this symbolism to impress the hearts as well as the minds of the people with a new conception of service one to another.